Come and enjoy our “Seaside Getaway.” The home is beautifully landscaped and freshly decorated inside. You’ll be just one block from the beach. It’s also just three blocks to Center Street where you’ll find many great shops and restaurants. The house features all new furnishings and electronics, including a 60' plasma TV in the living room, TVs in each bedroom, and WiFi. The master bedroom has a king-size bed and its own full bathroom. The first guest room also has a king-size bed with two twin beds in the second guest room. Check out the new pictures. If you are considering bringing a pet or two, please let us know. There will be an additional charge, but we'll make sure they are welcome too. I am the proud owner of the “Seaside Getaway.” When the military moved me to the Charleston 15 years ago, I fell in love with the area especially the great beaches. After retiring, there was no doubt where I wanted to be and am now proud to call the low-country my home and to be considered a local on Folly. Seaside Getaway is a perfect opportunity for me to do what I enjoy most: meet new friends, enjoy the laid back beach life, and help you enjoy all Folly Beach and historic Charleston have to offer. When I discovered this house, I knew it was perfect. I've been wanting to take a nice house near the beach and turn it into a wonderful vacation home. Seaside Getaway was the perfect opportunity for me to do just that. The beach access is a short 500' walk. We enjoyed our long weekend at Seaside Getaway. The house had plenty of room for our family of 5 and had a nice screened porch and backyard. It is an easy walk to restaurants and the beach. Kevin was very responsive to any questions/needs during our stay. The house was great close to beach and very clean. Will definitely come back. We returned for an extended "snow-bird" stay during January & February, & thoroughly enjoyed it! We had a wonderful stay for 2 months at 312 W. Copper. The cottage is conveniently located (a block from the beach, 3 blocks from Centre Street and 20 minutes from downtown Charleston), and fully equipped. We have spent January and February there for the past two years, and we hope to return next year. The cottage works very well for visiting guests and our dogs clearly have enjoyed their stay as well. Kevin is terrific to work with! We stayed here for a long weekend and loved it. The property manager was responsive and friendly, the house was clean and cozy, and was in such a great location - truly two blocks from Center St. and a block from the nearest beach access. We brought our two dogs, and we loved using the back porch to close them in and clean them off after a walk on the beach - it would be great to come back to in the spring/summer/early fall when you could use it for relaxing and reading. We love Charleston and will definitely be back, and we will be looking at this house first for our stay! 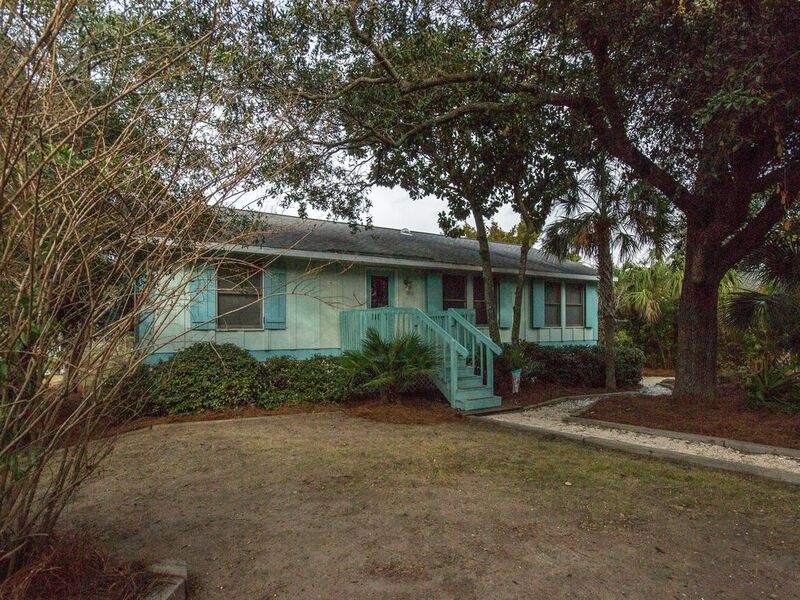 Great location that was a short walk to the beach and downtown area. The is a great size house with an open layout out, which had everything we needed with king size beds and a tv in every room. The owner was wonderful! This was my fourth visit to Folly Beach and it was the best. We were a family of five adults and the house was more than large enough for our needs. Upon arrival the house was spotless, there were flowers and snacks on the table along with the first mornings coffee which was much appreciated! The layout of the home was perfect if you have someone who snores as the bedrooms are on opposing ends of the house. As noted in prior reviews the large screened in porch surrounded by palm trees was very restful and relaxing. Trips to the beach were easy; about three minutes walk to the beach access. The main part of town was only a few blocks away and an easy walk or quick drive. We especially appreciated having a washer and dryer on site. This was a seamless relaxing vacation and I would certainly return to this house again. Thanks Kevin for sharing your home with us! We look forward to returning. My summer (June - August) change-over day is Saturday.